In 1938 a decision was taken to build a turf-fired electricity station at Portarlington which would be operational by 1941. However the war delayed this and work on the station only began in 1946. The station was finally opened this week 68 years ago on April 17th 1950. It was opened by Minister Daniel Morrissey and at the time was the largest peat fired power station in Western Europe. The opening was attended by a large number of invited guests and the station was blessed by the Bishop of Kildare and Leighlin, Thomas Keogh. In the early days the turf for the station was supplied from Clonsast and Timahoe bogs. The next station opened was Allenwood which came on stream in 1952. After a 38 year lifespan the Portarlington station closed in 1988. 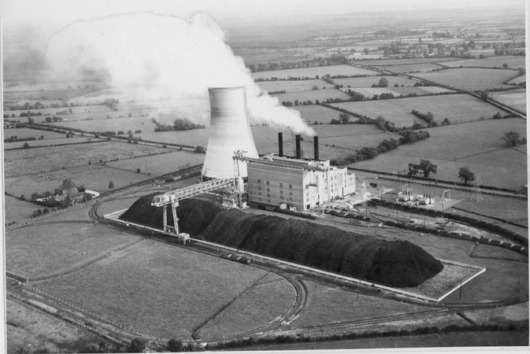 Interesting how over all the years when the history of Portarlington power station is written about - there is never a mention about how at least one man lost his life during the construction phase - Patrick McCraith - an uncle of mine - worth a reference at some stage don’t you think ? Ye I agree with you Declan McCraith. I remember my grandad telling me that. As he and my father both worked in power station. We produced a DVD of the History of Portarlington Power Station featuring interviews with people who worked in the plant, photographs of the building of the tower etc and finally the demolition of the main building and the landmark tower. Was there any mention of those who lost their life during the building ? Hi Declan, sorry to hear about your uncle's loss of life. I had no idea about that. The ESB published a book on Portarlington Generating Station after it closed, the author was Richard Mullins, it covered the history of the station from construction to closure. There is also a chapter on the development of Clonsast bog to supply the station. I don't have a copy of the book here in BnM so I don't know if your uncle is mentioned. There is also a History of the ESB published in 1984, this might be worth checking. Did your uncle work for the ESB?